"In academia today there is huge pressure to publish, and publish fast," said Professor Johann Mouton, director of the Centre for Research on Science and Technology, or CREST, and the DST-NRF Centre of Excellence in Scientometrics and Science, Technology and Innovation Policy at Stellenbosch University, South Africa. "It's important for university rankings and research metrics. It is important for academic careers - you don't get ahead if you don't publish. So academics are now turning to these predatory journals." In a recent study undertaken by CREST it was found that 40 PhD students in Ghana had published papers in predatory journals. "They didn't know they were predatory. But it comes out later when they are up for promotion," said Mouton. The largest number of papers - 476 - were published in the Journal of Social Sciences, followed by 413 in the African Journal of Business Management and 279 in the Journal of Human Ecology. All three of these journals are produced by publishers that feature on Beall's list of potential, possible or probable predatory scholarly open-access publishers. The authors came from a broad spectrum of South African universities including those with high rankings. But the authors are not to blame, according to Mouton, as they published in good faith as some of these predatory journals are on the approved listings provided by the Department of Higher Education and Training or DHET. "You can't blame individuals; they've done due diligence." 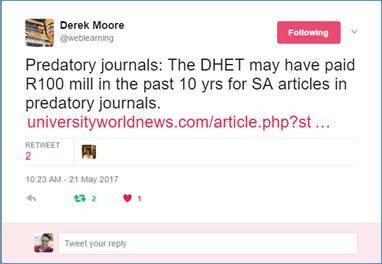 But that means the DHET - though they rejected many claims for publication subsidy - may have paid out more than R100 million (US$7.6 million) over the past 10 years for articles that appeared in predatory journals.